Is a family suite worth the splurge? Family vacations have evolved since we took our kids on vacation. When our kids were younger and money was tight, our vacations were pretty much driving vacations- the Jersey Shore, Virginia Beach, New England. But times have changed and now we have lots of families traveling that want something more. A couple of weeks ago, while at my chiropractor (who is also a client), Adam said that their family vacations have changed a lot since he started booking with My Vacation Lady. When they first started traveling with their children, they booked 1 room for all of them. He didn’t consider that privacy and or adult time would be something that can be included on a family vacation. Last year, they booked a family suite at the Finest in Playa Mujeres. Guess what— now they need to have the same kind of room for their next vacation. They can’t go back to a regular hotel room with 2 double beds. When My Vacation Lady helps plan our client’s family vacations, we take lots of things into consideration when recommending certain hotels and rooms. What are their bed times? What do the kids like to do during the day? Will they go to the resort’s kids program or hang out with you? What do the adults want to do during the day? Are you looking for some adult time during this vacation? We’ve been recommending family suites to families with 3 kids, teenagers, younger kids and even just 1 child. Why? Let’s take Adam’s family- his kids were 5 and 3 at the time they went to Playa Mujeres. The kids go to bed (even stretching it) at 9pm. Where does that leave he and his wife, when the kids go to bed? With a family suite (which is basically a second bedroom with 2 beds attached to the master bedroom with a king sized bed), Adam and Renee could relax on the balcony with a cocktail and not wake up the kids walking back into the room, they could watch TV or even have some alone time. 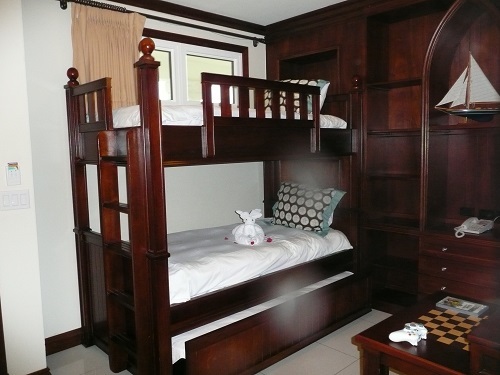 Let’s compare this with a regular room with 2 double or queen beds. Adam would be sleeping with his son. Renee would be sleeping with their daughter. If they stayed on the balcony, they would have to be very quiet coming back into the room. Watching TV??? There are some great resorts with family suites and not all will break the bank. So when it comes to your next family vacation, which would you prefer? We can help with either! By Mindy Gilbert|March 19th, 2018|Categories: All|Tags: all inclusive family vacations, Caribbean family friendly resorts, family friendly resorts in Mexico, family suites, family vacation planners, family vacation travel specialists, family vacations, rooms for family vacations|Comments Off on Is a family suite worth the splurge?